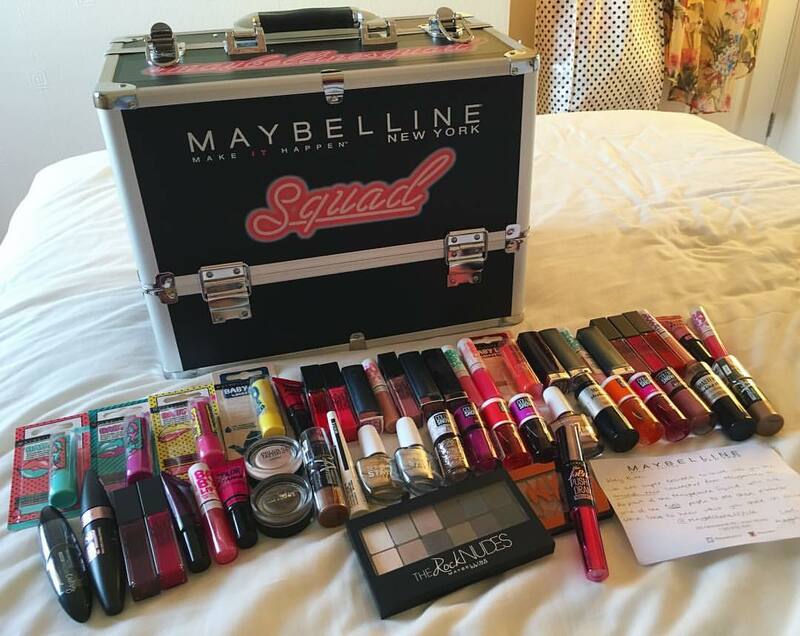 the Maybelline NY UK team have chosen me as their latest Maybelline Squad member! It means that they’ve sent me a personalised make up trunk brimming with fantastic goodies to review, with the option to attend industry event opportunities… and I couldn’t be more thrilled. It’s probably going to take a little while to review each and every product, but I can reveal a few sneak-peak details… including names of some items which haven’t even hit the shelves yet! Maybelline Products – At a Glance. Besides an assortment of new Baby Lips products to test, including the entire gloss range and new balm flavours, I’ve received: a handful of Super Stay Metallic Nail Varnishes, Jelly Tints, 2 Master Strobing and Contour Sticks, Lip Paints, White Master Ink, Color Tattoo Gel Cream Eyeshadows… you name it, Maybelline have sent it! So now that I’ve teased about the products that they’ve sent me, it’s probably time for me to shut-off from blog writing and start testing! In the meantime, hold tight and follow my blog! yay! i’m so excited for you!! can’t wait to read your reviews. hope you got some vivd lipsticks — they are my fave. That’s amazing. So fun. Congrats. Congrats! Sounds like such an amazing opportunity! Can’t wait for some of the reviews! Congratulations! From one blogger to another, I know just how amazingly exciting this must be 😀 Can’t wait to see the reviews! I came across your site when you liked my Too Faced post on the Sweethearts Bronzer. I have been enjoying reading your posts, especially the Kiko ones (just got into Kiko recently). Looking forward to reading your upcoming posts on the products you were sent! I love Maybelline mascaras and their Lumi undereye concealer. I am curious to see what their other products are like.